What a terrible year 1993 was. Terrible for me personally, but terrible globally too, because the whole world at that time fit snugly inside my private cosmos of terribleness. Everything was going wrong. 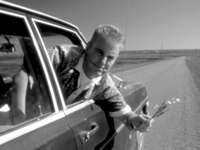 I had fallen prey to depressions, vapors, and runaway libido. I had panic attacks on public transport. I doubted, quite sincerely, my own existence. I was 25. And then, precisely 20 years ago, I saw Groundhog Day, starring Bill Murray. The counsels of the universe are constant, I think, but perhaps more easily heard when one is freaked-out or metaphysically exposed. The movie spoke to me, at any rate, this bizarre romantic comedy about a grumpy, middle-aged weatherman who must relive the same day over and over until at last he bursts the spirit’s sleep and gets Andie MacDowell to fall in love with him. It spoke at me, in my deeper-than-deep cluelessness, with intimacy and authority: it was a Message. Perhaps you received the Message too. Or did Groundhog Day just bounce off your noggin like a slightly more abstract Trading Places? If so, you were probably not, at that particular moment, a seeker: spiritually curious, mystically a-tremble, slightly mentally ill, whatever. “I started getting mail from a remarkable cross section of people,” screenwriter Danny Rubin tells us in his book, How to Write “Groundhog Day.” “The first note I remember came from a monk in Germany. He had discovered Groundhog Day as a perfect articulation of his Christian beliefs.” As his movie penetrated the noosphere and his mailbag swelled, Rubin found himself similarly embraced by Kabbalists, Buddhists, Nietzscheans, and excitable therapists. Drilling away in the Hollywood fashion, a hole here and a hole there, the makers of Groundhog Day appeared to have struck, almost by accident, a water main of meaning. The Message, as I heard it, was this: There is a way back, a way through the imprisoning mystery of yourself, a way back into life. So let’s retell, relive, the central plot device one more time. Weatherman Phil Connors, of Channel 9, Pittsburgh, is dispatched one freezing February to the town of Punxsutawney, Pennsylvania. His assignment: to cover the Groundhog Festival, a strange bit of real-life pagan whimsy involving a groundhog, its shadow, and the possibility of six more weeks of winter. Phil (Murray) is bored and hostile; he flirts spikily with his producer, Rita (MacDowell), and bullies his cameraman; he disdains the cheery locals and their festivities (“hicks … morons …”); he spurns a dozen occasions to chat/connect/relate; he can’t wait to wrap up this piddling gig and get back to Pittsburgh. But a huge snowstorm—which he had predicted, with meteorological hubris, would pass by harmlessly—blocks his way home. Trapped in Punxsutawney for the night, comprehensively disaffected, he signs off and crashes out. When he wakes up the next morning, it’s Groundhog Day. Again. Same conditions, same people, same ritual. So it goes the morning after, and the morning after that, and on and on ad (apparently) infinitum. Phil is in a loop, a temporal locked groove. He’s stuck. That’s the premise. It’s high-concept, but then, so was Franz Kafka. At early meetings between Rubin and Groundhog Day director Harold Ramis (with whom he collaborated on the screenplay), the two discussed the possibility of an external cause for Phil’s predicament—a magical clockmaker, maybe, or a gypsy’s curse. In the end, however, they thought it best to leave the recurrence of Groundhog Day unexplained. This was a profound creative decision. As in Kafka’s The Metamorphosis, the rupture with normality—the hex, the divine accusation, the black joke—has the appearance of arbitrariness. Gregor Samsa awakes one morning to discover that he has turned into a giant insect; Phil Connors awakes one morning to discover that the world is repeating itself. The onset is sudden. No reason is given. And yet, the rupture is not quite arbitrary: just as Gregor’s new beetle-life seems to have something to do with his stifling domestic circumstances and his awful job, so Phil’s stopped clock is all about his Phil-ness, his unrecognized despair. Depression, by its very nature, feels like the crime and the punishment at the same time: your primary relation to life is distorted, you are a stranger to gratitude and fidelity, your spirit sickens, and somehow—and this is the real pisser—you know it’s your own fault. We accept Phil’s never-ending Groundhog Day as a sentence passed upon his character, the net result of his accumulated misbehaviors in Punxsutawney. But Phil learns. He learns contentment, and he learns forgiveness, and he learns kindness. He sits in the Punxsutawney diner, happily reading—but he’s not just reading, he’s radiating Buddha-nature. It’s all expressed in the trajectory of his relationship with Rita. He wants her, he tries to seduce her—first with meanness, then by fraud, then with recitations of French poetry and engineered perfect moments. It is only when he gives up, when he accepts the blessing of her company, free from desire—at which point she, too, magically becomes a far more interesting character—that she is delivered into his arms. Oh, it deepens with every encounter, this movie. I watched Groundhog Day twice while writing this column. I think I need to watch it again. 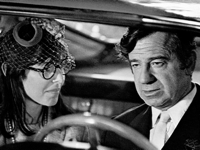 A smirking spendthrift (Walter Matthau) must make a marriage of convenience. He selects a clueless but wealthy botanist (Elaine May), planning soon to murder her. But lo, she beguiles him with her gaucheries, and he stays his homicidal hand. The film leaves you snuffling gratefully. Wes Anderson’s first, and one of his finest. Fresh from a stint in a mental hospital, a confused young man (Luke Wilson) embarks upon an incompetent crime spree with his best friend (Owen Wilson). But he’s really only doing it to make his friend happy, a fact that becomes clearer and more beautiful as the movie progresses.